You know how they say, “teamwork makes the dream work”? At Social Media Delivered, this phrase is nothing short of accurate. My dream all started with a hashtag. A mere pound symbol followed by a cluster of words changed my entire life. Social media makes things happen. This is my testimonial. This journey began two years ago, when I trudged my way to Dallas to further my education at the University of North Texas (UNT) and seize my passion for journalism - go Mean Green! The treacherous climate of North Texas was more than my raised-in-the-piney-woodlands heart from East Texas could bear. And as the tornado sirens wailed through my cramped student apartment nestled between I-35 and UNT, I grabbed the clicker and turned to the local news station. What I witnessed next changed my life forever. No, there wasn’t an F-5 tornado sweeping across Denton. And no, construction on 35 was nowhere near complete. On the small, 12” hand-me-down television screen was a hero. That hero was Pete Delkus, WFAA Channel 8’s Chief Meteorologist. Innocently, I ‘followed’ him on Twitter, unaware that I would one day admire him and his dedicated passion for pollen counts. After the great storm of 2014, I learned that Delkus was not only a weather connoisseur, but he was also a social media pro. He was shutting trolls down left and right; he was communicating frequently with his viewers’ questions and livestreaming content on his days off. It’s almost like he and my CEO Eve Mayer at Social Media Delivered were long-lost twins who’d discovered the power and influence that social media can have. In fact, it was through social media that Eve and Pete first met. Eve’s interest was peaked after hearing of my admiration for the famous Channel 8 weatherman. In the simplest of terms, Eve reached out to Pete on Twitter. However, saying she simply reached out to Pete doesn’t quite do it justice. Eve sculpted an entire marketing campaign centered around me wanting to meet Pete. It was three little words with one big meaning: #ChloeMeetPete. Her fingers danced swiftly across the keyboard as she not-so-discretely conspired to have my dreams fulfilled. And with the click of the ‘tweet’ button, we waited. As the entire Social Media Delivered squad awaited Pete’s response, their knuckles grew more and more pale as they tightly crossed their fingers for good luck. Many of my especially anxious coworkers patted the beads of sweat off of their foreheads as they refreshed Delkus’s Twitter feed, hoping for a response. My anxiety and hope grew larger than life with each tick of the clock. Then, there it was. The tiny notification badge clung onto the Twitter app icon so majestically, like it had a purpose. It was like opening my college acceptance letter all over again. The pressure rained down on the staff as we opened his response - only to find that he wanted to meet me too! Pete graciously provided his email and just like that, in a single 140-character-or-less tweet, I was one step closer to crossing meeting Pete Delkus off of my bucket list! Less than three weeks after Eve and Pete’s Twitter exchange, the staff began rummaging through the plethora of emergency art supplies Social Media Delivered had on hand. The aroma of scented markers filled the void between my anticipation and disbelief. My astounding coworkers and I were going to meet the Pete Delkus. The man who warns us not to go outside during the storms. The man who stays up all night alerting people when hazardous weather is on its way. The man who is a hero to everyone in Dallas. We were going to meet him in all his weather glory. In an office filled with journalists, creative writers, tech nerds and business professionals, the SMD staff prepared for the meeting the best way they knew how - by creating banners and posters to support me on my big day. 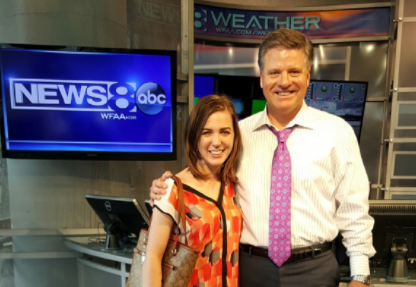 Trying to accurately describe our meeting with Pete and the WFAA staff is… indescribable. But I will try. As we stood outside the glass building framed with alabaster trim, we unsuccessfully attempted to contain our excitement. Our lack of rhythm while dancing paired with our inability to remain quiet caught the attention of Delkus, who was no doubt impressed by our enthusiasm. Pete Delkus welcomed me and my coworkers into the studio. On this particular day, my dream wasn’t the only aspiration that was fulfilled. The entire company’s dreams had come true for several reasons. First of all, the joy on my coworkers’ faces was priceless. They watched in amazement as the WFAA reporters interviewed subjects in person. They were genuinely thrilled to be there. Secondly, Social Media Delivered is an amazingly unique place to work. All of the employees support one another’s dreams. No matter how big. No matter how small. And especially when your dream is to meet the local weatherman. Those who work at Social Media Delivered support others who work at Social Media Delivered. Watching your coworker achieve goals and dreams is a group effort. And reaching my wildest dream wouldn’t have been possible if it weren’t for a fun-loving weatherman, a great group of colleagues and the far-reaching power of social media. Social media opens a world of opportunities for anyone, regardless of their goal. You too can accomplish your dreams. Tweet about it. Post about it. Who knows?! Maybe you can meet your hero too. Want to achieve your wildest dreams? Apply for one of Social Media Delivered’s internships!